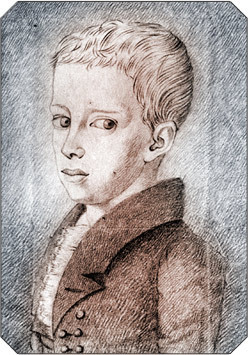 Fredrik Pacius was born in Hamburg on 19 March 1809. His father Johann Conrad Ludwig Pacius was a wine merchant and his mother was Maria Margaretha Schumacher. It is believed that the Pacius family is a branch of the Pazzis, an old Italian family of bankers and merchants. The Palazzo Pazzi, built in the 16th century, is found in Florence. From an early age, the boy who was nicknamed "Fritz" showed an interest in music. The family often played music together and Fritz could, for instance, join his family members and play quartets. He was also good at drawing and dancing, and was interested in languages. His father wanted him to become a businessman, but Fredrik Pacius was more interested in music. 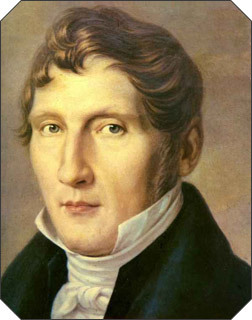 With the approval of his father and Methfessel, a musician from Hamburg, Pacius travelled to Kassel, where he between 1824 and 1826 studied composition and the violin with Louis Spohr (1784-1859) and the theory of music with Mauritz Hauptmann (1792-1868). Spohr was one of the most prominent composers and violinists of his time, and later on, Pacius always remembered the tuition he had received with great gratitude. Spohr’s music always brought to his mind “the happy days of youth”. Pacius composed his first works as a teenager and already during his studies some of his solo songs were published in Hamburg. Initially, however, Pacius sought to make a career as a violinist. He held his debut concert in Hamburg and between 1826 and 1828 he made an extensive concert tour in Northern Germany. At a concert in Stralsund he met a member of the Stockholm Philharmonic Society, who persuaded him to join The Royal Court Orchestra in Stockholm as first violinist. Pacius accepted the post. However, he did not particularly enjoy Stockholm, and so he started to look for work elsewhere. At first, he considered moving to Uppsala, where a position as musical director of the university was open. When he heard that a similar position was open in Helsinki, he sent an application there. It was accepted in the spring of 1834. 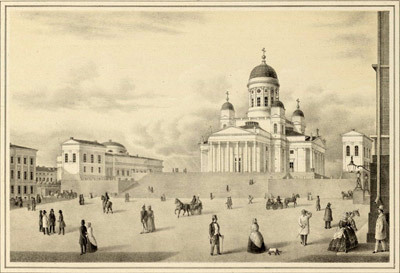 Pacius travelled to Finland in the beginning of 1835. The journey across the sea in capricious and ice cold weather was very dangerous, because it was made in a post vessel with an open deck. Part of the journey was made on foot on the ice.